The capital of Sweden, Stockholm, is also the country’s largest city, with more than 930,000 inhabitants. Other large cities are Gothenburg, in western Sweden (population 550,000), and Malmö (population 300,000) in the south. Uppsala and Lund are well-known university cities. Less than three per cent of Sweden’s land area is built up and forests cover 69 per cent of the country. 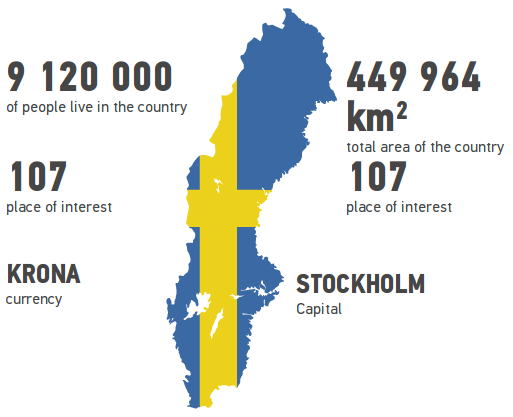 Sweden is long – some 1,574 kilometres from top to bottom – and can be divided into three major regions: Götaland in the south, Svealand in the middle and Norrland in the north.